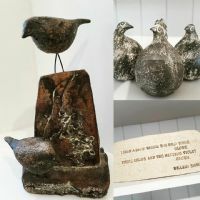 Over the last 19 years, Andi has worked from her home studio in Marlow where she produces a range of unique stoneware ceramics heavily influenced by her strong love of the garden and all that lives in it. In later years her work has become increasingly sculptural and narrative. Andi’s work has been sold by prestigious retailers including Daylesford Organic (the Cotswolds and London) and Town Garden (Oxford).